The NASA and United Space Alliance (USA) team at Kennedy Space Center (KSC) have begun the final preparations to transport Discovery to her retirement home outside of Washington, D.C. Rolling out of High Bay 4 of the Vehicle Assembly Building (VAB), the fleet leader made a sober roll to the Mate Demate Device (MDD) ahead of her farewell. NASA 905 – the original Boeing 747 Shuttle Carrier Aircraft (SCA) that NASA purchased in 1974 – arrived at the Shuttle Landing Facility (SLF) on Tuesday evening, as work ramps up for a final time on Discovery at KSC. The SCA touched down on Runway 15 at the SLF after making the cross-country flight from Edwards AFB in California, where the aircraft is based. The 747 taxied to the south end of the landing field where the Mate Demate Device (MDD) is located and parked for final preparations to get it ready for Discovery to be mated to the aircraft over the weekend. Ahead of Discovery’s arrival for mating operations, workers from USA and CSC Applied Technologies unloaded support equipment from the 747 and worked to lift and attach the ball mounts to the aft attach points on the plane on Wednesday. Ahead of the final roll, Discovery weighed in at approximately 167,000 pounds, including the 5,900-pound weight of the aerodynamic tailcone needed for the ferry flight; in comparison, when the orbiter was rolled over from OPF Bay 3 to the VAB (without the tailcone) for STS-133 in October, 2010, she weighed about 195,000 pounds in a flight configuration. In addition to the draining of internal fluid commodities and the removal of internal Reaction Control System (RCS) and Orbital Maneuvering System (OMS) tanks and plumbing, the Replica Shuttle Main Engines (RSME) lack almost all of the elements of the engine powerheads. With Discovery arriving at the MDD on schedule at 7am on Saturday morning, she was aligned with the lifting sling that will lift Discovery off her landing gear and the orbiter will be leveled. 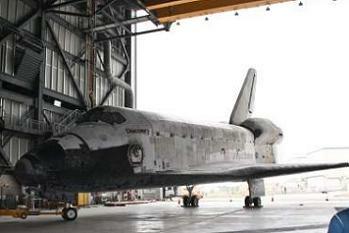 Next, Discovery’s landing gear will be retracted and the landing gear doors will be closed. 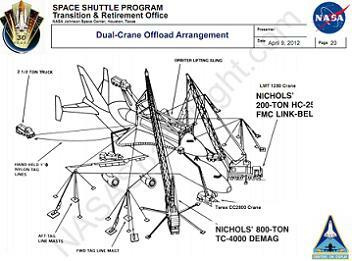 The sling was then to lift Discovery up high in the MDD so that the SCA can be positioned underneath. However, that was delayed to Sunday due to high winds. The schedule on Saturday involved work that was to be completed to the point of “soft mate,” which in this case means when the sling has lowered Discovery down onto 747 attach points, and an initial torque is put on the bolts. With this moved to Sunday, April 15th, workers finished Saturday’s delayed work, through to bolting Discovery to the SCA. The sling was then lowered around the orbiter so that the 747 started to bear Discovery’s weight, and then the sling was disconnected. On Monday morning, April 16th, the mated Shuttle orbiter/747 duo pushed back out of the MDD, ready for takeoff at first light the next day. The ferry flight on Tuesday, April 17th, is planned with additional time for low-level fly-overs of the Cape Canaveral and KSC area at the beginning of the flight and historic locations in the Washington, D.C. area at the end. 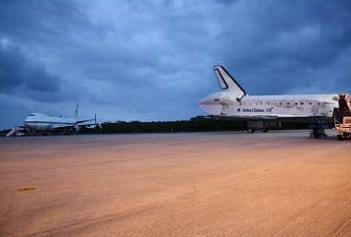 Once Discovery arrives at Udvar-Hazy and takes Enterprise’s place in the James S. McDonnell Space Hangar, Stilson said there was still some remaining work to do to configure the orbiter for permanent display. She also highlighted other post-ferry work: “There are some ferry struts that hold those engines in place that we need for future ferry flights, so we’ll replace those with struts that we can leave in place, permanent struts there. We’ll need to go in and reconfigure some vent doors, they want to close the vent doors, (and) some small things inside that they want us to reconfigure for them.